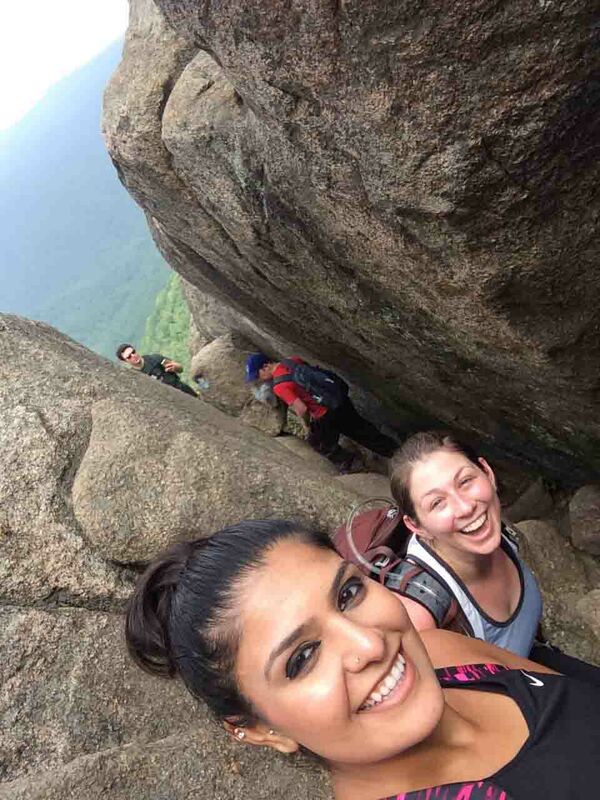 Recently, my friend Sireen and I went out to Old Rag. This is the one hike you have to accomplish if you want anyone in this region to take you seriously as a hiker, and I’ll be real, Sireen and I would really like some hiking street cred. I’ll give my full thoughts on the actual hike in a later post. But my real takeaway, beyond the awesomeness of the hike, is how much we lucked out with our temporary trail friends. While I stared into the rock with mounting hopelessness, I watched as one adventurous gentleman precariously lowered himself into the crevice by gripping the sides of the rock and carefully negotiating himself down using his arm strength. After he reached the bottom, another member of his party handed his crying son to him. It was awful, the boy was terrified. I cheered for the kid when he got into the crevice – anything to make the little guy feel better. But inside, I felt like that little boy. I wanted to sit down and do some messy crying too. Here’s an unfortunate fact about me, I’m not very trusting. I’m a permanent smiler, so people usually think I’m very friendly and approachable. Behind the smiling face, I’m kind of reserved. I have a hard time trusting people I don’t know, I don’t like approaching people I haven’t met in a controlled setting, and I don’t like talking to strangers. I had to talk to some strangers. There was no other choice. The options were to talk to strangers or turn back, because we didn’t know how to do this alone. Luckily, an awesome girl and her guy friend were right behind us on the trail. The girl and I had matching Osprey bags, so I knew she was wise. Her guy friend made us take a closer look at a narrow opening in the rocks that I’d earlier ruled out as a possible entrance into the crevice. He took off his pack, shimmied his way through and then turned around to help us. We handed him our packs, and then he helped guide each of through the narrow opening. It was amazing. If it wasn’t for that small moment of kindness, I don’t know…maybe we would have still made it down. Maybe we would have turned around. Who knows? But they definitely got us back on the right track faster. 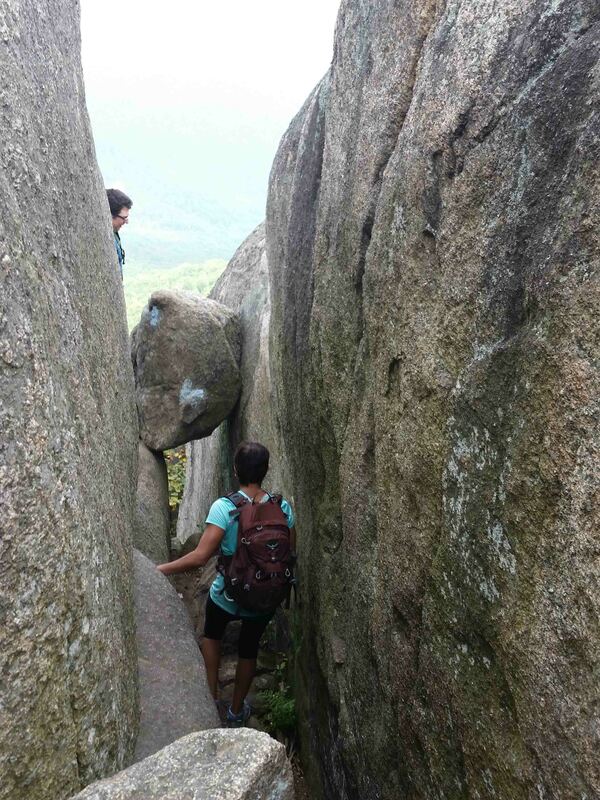 One of our trail friends leads the way through a tricky part of Old Rag. There was a core group of about 10-15 people who were all hiking at the same pace as us. As we puzzled over which steps to take, it became normal to ask the others which way to go when the trail seemed unclear and to check with them on where we should put our feet and/or hands on the next boulder. I offered my hand to help strangers up. At one point, a nice older woman even tried to give Sireen a boost by pushing up on her bottom (in the nicest way, of course!). And the kindness continued after the hard part was over. When we made it to the composting toilet by the Byrd’s Nest shelter, without any prompting, a young woman offered me one of her biodegradable wipes. The kindness even made it off the trail as we prepared to go back to the real world. We spent six hours hiking. Six hours. That’s a long time. We were tired and more than ready for some celebratory post-hike BBQ. We were all set and ready to take off, but when Sireen went to turn the car on, it made this weird clicking noise and refused to start. For reasons that I don’t understand, Shenandoah is in the middle of a cellphone service-free zone. We’re talking zero service—nada, zip, zilch—when we’re in the park. Normally, it doesn’t matter and is a nice break from technology, but we just found ourselves neck deep in a car crises without the use of cell phones. It was 5:00 pm and the Old Rag ranger station was already closed for the evening. Thankfully, after a previous crisis earlier in the summer, I knew that there would be an emergency phone on the side of the ranger station. Sireen hopped on the phone and an awesome guy at the Shenandoah emergency center tried to connect her with local car places, but it was a holiday weekend, and none of them were willing to send someone out to help us. I walked back to try her car again, but it was still stubbornly refusing to do anything except terrify me with the clicking. Out of options, I squashed my fear of strangers and asked a nice young couple who just returned to their car if they had jumper cables. The guilt was real. I knew how tired they were, I was personally feeling the same post-hike exhaustion, and I hated to drag them away from starting their travel home. But the couple was super nice and agreed to meet me back by Sireen’s car. The guy knew things about cars, which was more than I could say for either of us. He tried to jump the car twice, but it was no good. We thanked the couple sincerely and, out of options, went back to the emergency phone to see if the nice Shenandoah emergency people could connect Sireen to her brother. I swear at that moment, as I swallowed all of my stranger danger fears and hopped into that car, I could almost hear that symphony hallelujah music that plays in the movies. It took less than 10 minutes. Awesome Dude hooked the jumper cables up, I turned on the car, and it just started. It was magic and then he was gone—I didn’t even really properly thank him before his caravan was on its way home. It was a huge shame because he deserved more than just a small thank you and my appreciation. Awesome Dude lived up to his name. Awesome Dude saved us. During all of this excitement, Sireen stayed back at the emergency phone trying to connect with her brother. Since she couldn’t see her car from the ranger station, I had no choice but to drive it up to her (under no circumstances could we turn off this car until it was back in the cell service zone). This is a big deal, since I don’t like to drive, almost never drive, and certain people in my life think I can’t drive. It felt dramatic, like I was riding up on a shining white stallion to save the day or something. But that moment of realizing that we would get back home after a grueling day on the trails? Priceless. Thank you, strangers. I don’t know any of your names and pretty soon, I’ll forget your faces, but I’m not going to forget your awesome good deeds. I loved this – especially the first paragraph and how it tied into the ending.